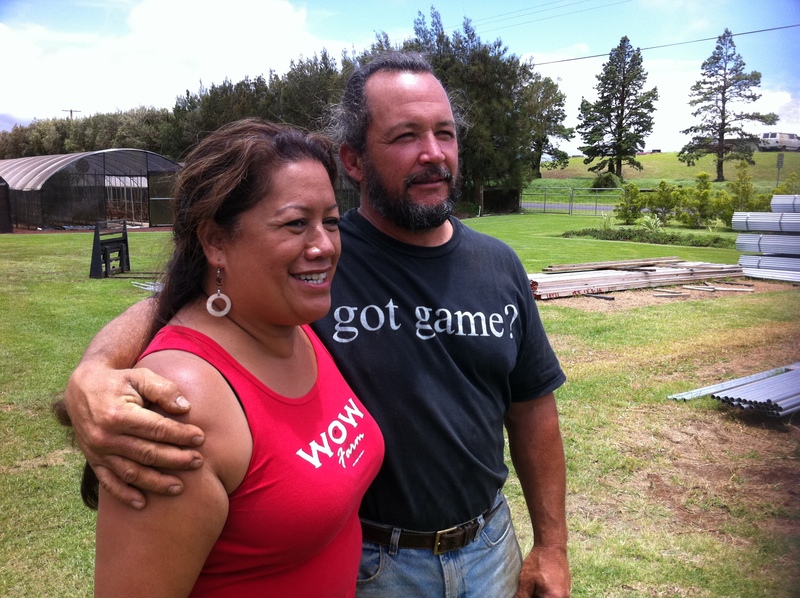 Agriculture homesteaders Tricia and Mike Hodson are the proud owners of their Puʻukapu-based family business Wow Farm. PU‘UKAPU, HAWAI‘I – When Tricia Hodson inherited her father’s agriculture homestead lot in Waimea back in 1989, she and her husband Mike, knew very little about agriculture and farming. Mike had spent 27 years with the Hawai‘i Police Department, and Tricia spent her time homeschooling their four children. Now, Tricia and Mike run one of the most successful organic tomato farms on theBigIsland– Wow Farm. The Hodson kids – Risse, Chrystal, Micah, and Baba – are all grown up and help run various aspects of the family business, on top of their own educational and entrepreneurial pursuits. The farm produces about 5,000 – 10,000 lbs. of tomatoes a week on their five-acre lot in Pu‘ukapu. Wow tomatoes are sought by chefs at the Four Seasons Hualālai, Mauna Lani Bay Resort, and the Hilton Waikoloa. Not to mention their loyal farmers’ market customers on both Hawai‘i and O‘ahu. Wow Farm produces 10 varieties of tomatoes including the Waimea red (top left), Pukalani yellow (bottom left), and Nohoʻāina Orange (right). But success did not come easy for these first-time farmers. The Hodsons committed early on to an all-organic operation, using no chemicals or pesticides, which took them through a series of trial and error. “It was tough in the beginning. We lost our crop three times because we never wanted to compromise and use Roundup,” said Tricia, referring to the herbicide commonly used by farmers to kill weeds. Mike calls it “mālama ‘āina.” This traditional concept of mālama ‘āina continues to guide them. The Hodsons built their first greenhouse in 2006. When they first started seeing profits from the sale of their organic tomatoes, this taste of success helped build ambition and drove them even further. “It was that burning desire to succeed,” said Mike. He made sure they tempered their excitement with responsible business sense. “The mistake people make is they think they gotta go big,” said Mike. Rather than spending their initial profits on expansion, they reinvested in their one and only greenhouse. Fast forward to today, the Hodsons have 35 greenhouses, with an additional two, recently-completed greenhouses up the road on another five-acre lot. According to Tricia, having this many greenhouses in Pu‘ukapu is a rare sight. 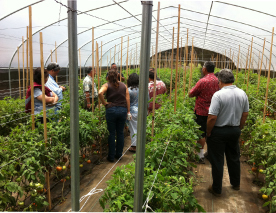 The Hodsons give the Hawaiian Home Lands staff a tour of one of 35 greenhouses on their five-acre lot. The Hodsons recently secured funding to run a pilot program that would provide turnkey greenhouses to 12 homestead lessees. The self-help program would require all ‘ohana to kōkua each other in building greenhouses on each others’ lots, while at the same time growing and harvesting food for their ‘ohana.